When you terminate traffic in Uganda, you can earn over $250 per channel of equipment. As in other African countries, there is a fairly high rate and low rates for local cellular communication. Uganda Telecom is the third mobile operator on the market in terms of subscriber base as 2 million people use its services. To ensure that the termination of GSM traffic brings good profits, it is important to choose the optimal tariff plan. To begin with, you need to purchase new SIM-cards. In Uganda, the cost of the start package is about 50 cents. TickTok. Calls within the network and to the numbers of other operators are charged at $0.08 per minute. Kwik-Tock. The subscription is $0.12, with the user being able to call $0.05 per minute. Endobo. For $0.21, the subscriber gets 450 free minutes for calls. Bonga Forever Bonus. When you top up the account, a 100% bonus of the top-up amount is granted. Kizze. By topping up and using the money for calls, the subscriber gets his money back to the balance and can use it for voice communication. 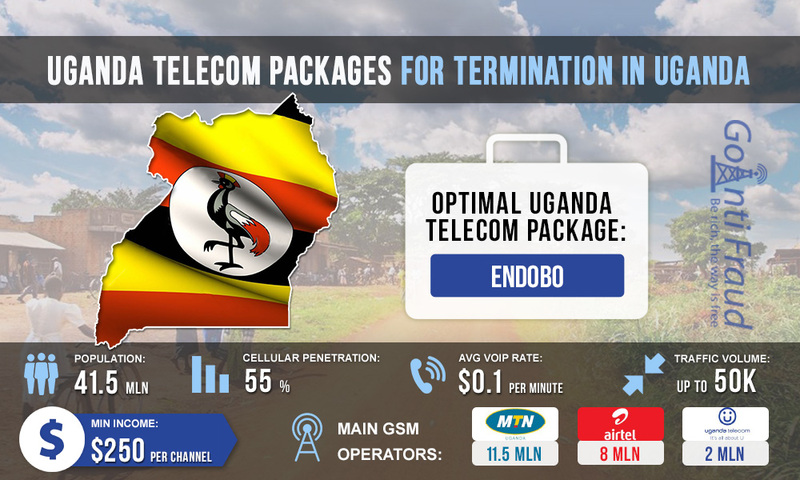 The most profitable tariff plan from Uganda Telecom is Endobo. When you connect to it, the minute of conversation costs about $0.001. Using the Endobo package, the terminator can make about $800 via one channel. If you install multi-channel equipment such as Dinstar Bangladesh or GoIP, your earnings will increase significantly.